Climbing roses soften a stone arch. The rambling English country house looked like it had been there since at least the 1920s (in fact, it was built in 1973). 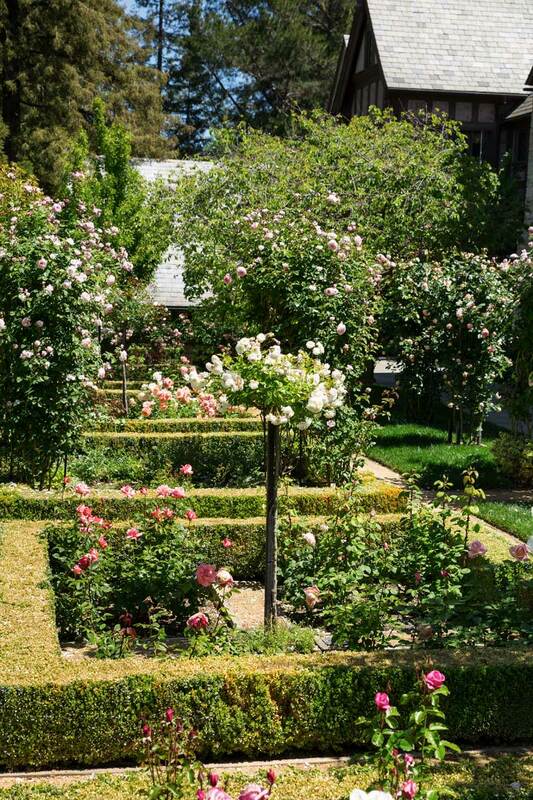 Set on five acres south of San Francisco, its original landscape plan had been laid out by renowned 20th-century landscape designer Thomas Church. Even after almost a half-century, it remained a testament to his genius. A long, winding entrance drive led to the house through groves of coastal live oak and past stretches of lawn, lending a stately presence. 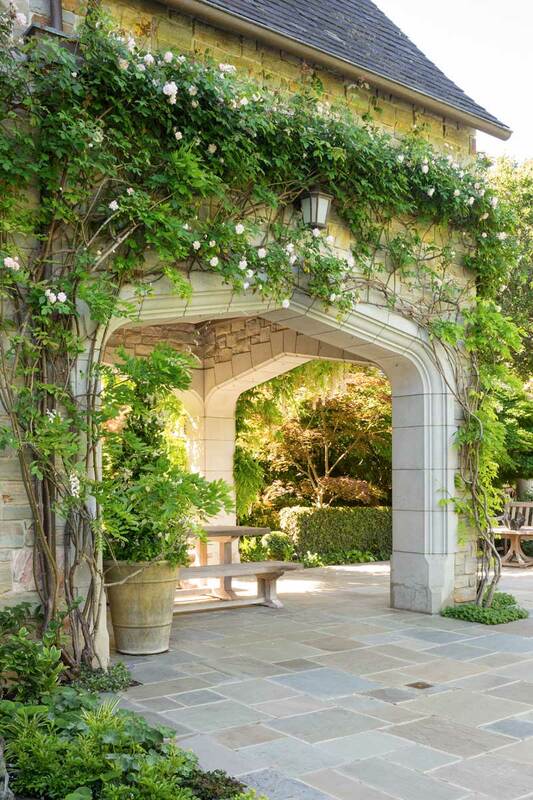 Already, a series of outdoor rooms afforded multiple viewpoints around the property, and broad terraces helped integrate the handsome stone Tudor into its surroundings. 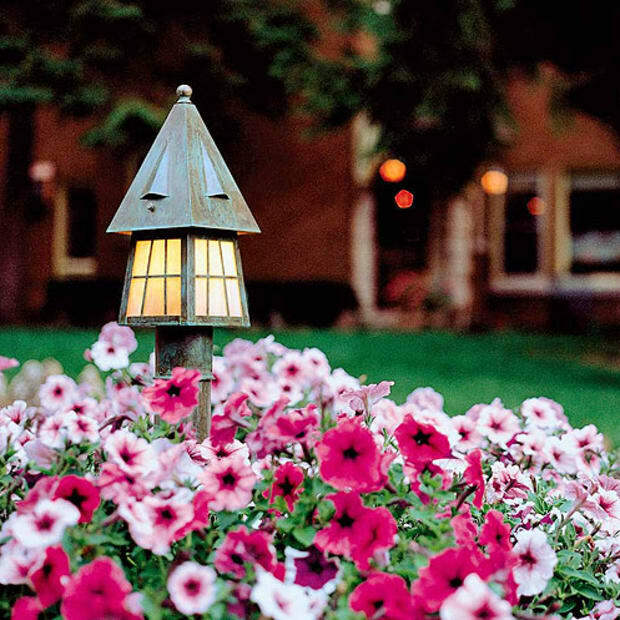 But by the time the current owners purchased the property some years ago, the gardens needed reinvigorating. 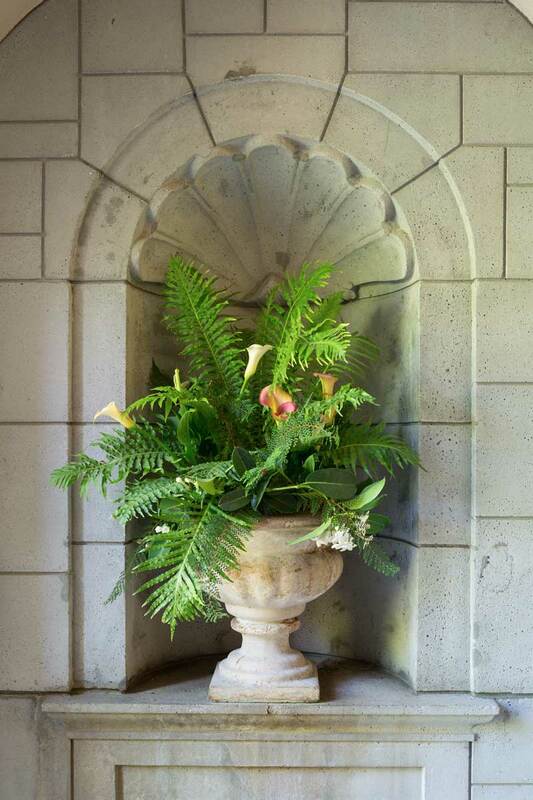 A niche near the front door holds an urn with ferns and calla lilies. Several of the once majestic live oaks, so important for privacy, were in decline; a specimen stone pine, long a focal point, had been lost in a winter storm. Around the pool, the perennial gardens needed reworking, and the kitchen and cutting gardens were tired. Working with landscape designer Stephen Suzman (who is now with Zeterre Landscape Architecture), these owners restored the property over the next decade, carefully preserving Church’s design while updating sympathetically. 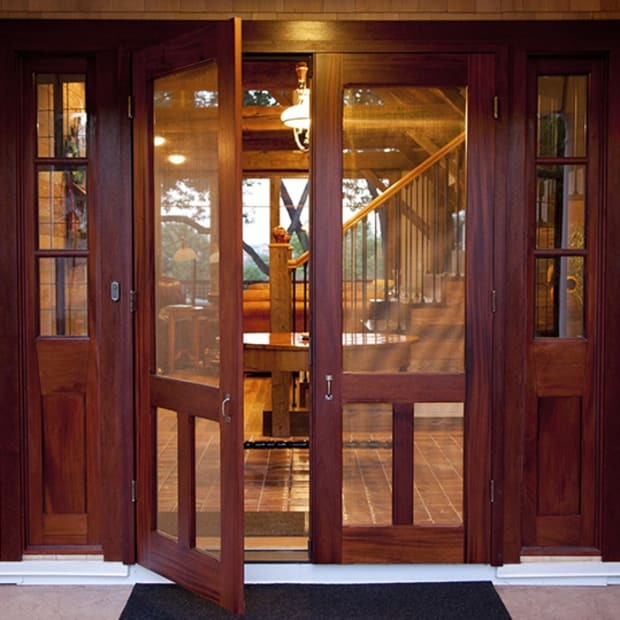 Near the house, garden rooms are formal. 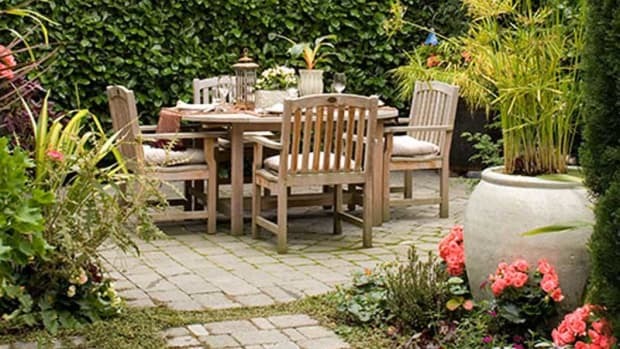 Centered in a grass island on the rear terrace, an antique, carved stone planter is the focal point. The table is a design by English architect Edwin Lutyens. A gracefully winding drive sets a tone of anticipation. It was now given more emphasis, including a new entry court laid in cobblestones, which replaced an asphalt parking strip. Towering eucalyptus lining the drive were supplemented with redwoods. Near the house, purpleleaf plum and Pittosporum, grown unattractive, were removed and replaced with a simplified ground cover of uniformly graded ivy. The homeowners love specimen trees, Stephen Suzman explains, so he introduced more of them as focal points and as screens to better enclose and define different sections of the landscape. A trio of large swamp oaks (swamp white oak Quercus bicolor) replaced a giant live oak lost to Armillaria root rot; specimen apple trees were planted to screen the back terrace; a new horse chestnut and a graceful weeping beech added interest to the central lawn. Drainage had been problematic as the center of the property rested in a low basin, and was one of the reasons the old live oak succumbed; water was rerouted with French drains and the clay soil supplemented with organic substrate. The property’s hardscape was updated, more in keeping with the architecture (rather than the 1970s). Wire-cut brick pavers on terraces had clashed with the house’s color, scale, and Tudor character; they were replaced with more attractive bluestone. Terraces both in front of the house and in the rear extend the house into the landscape. Lovely stone balustrades in the front rose garden, original to the design, have been replicated for back terraces as well, unifying and integrating the two aspects into a seamless whole. 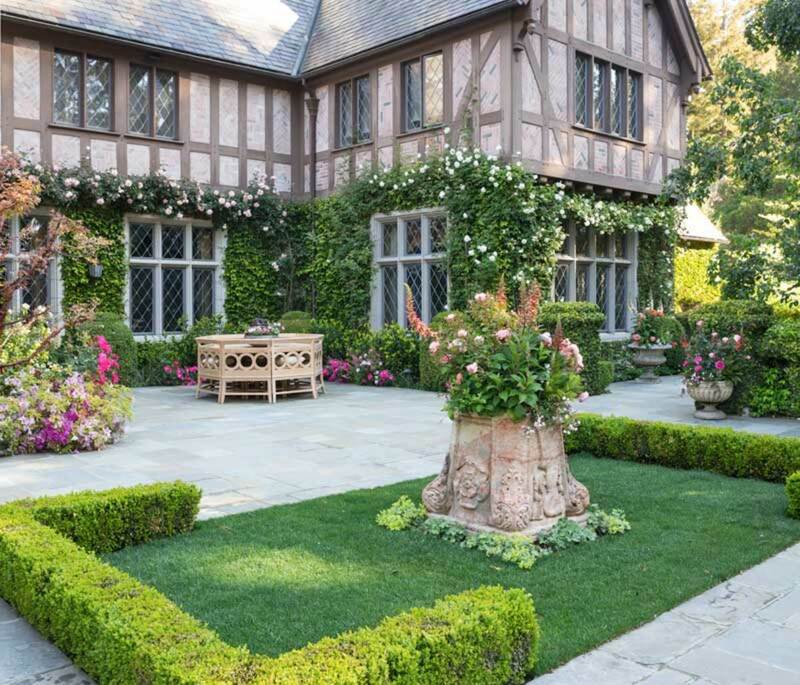 Trimmed boxwood adds definition to the rose gardens in front. Suzman added structures throughout for height, and also to separate and better define the plantings. 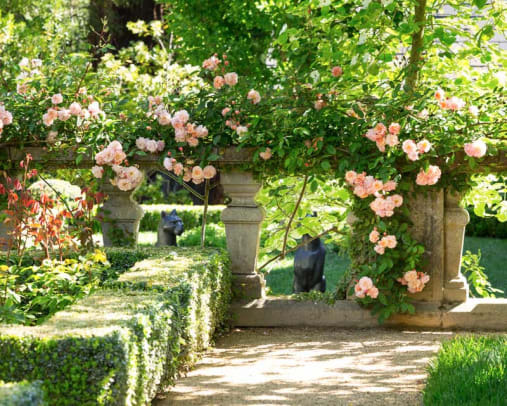 Tuteurs and arbors showcase the roses, while an Asian pear tunnel designed by Suzman, overplanted with climbing roses, creates an enticing passageway from the front gardens to the working beds on the southern end of the cultivated garden. A new pergola helps shade and soften the greenhouse. The rear terrace is a garden room, its walls formed by the house’s lovely diamond casements, over which clamber climbing roses. It is “carpeted” with a lawn set into the bluestone, and furnished with a carved stone planter and a fanciful table designed by English country-house architect Edwin Lutyens. 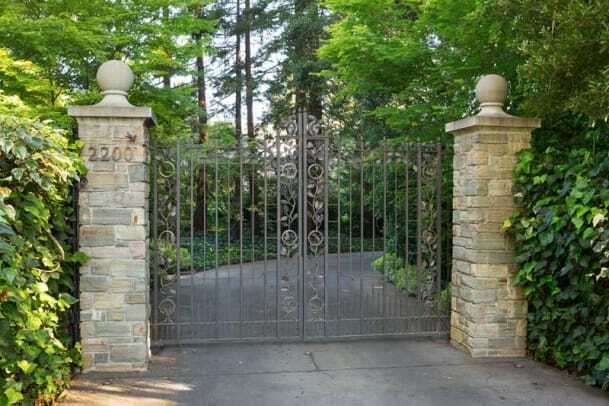 “These owners love the magic in nature,” says interior designer Paul Wiseman, explaining his inspiration for the pair of custom bronze gates set between two stone pillars at the start of the garden drive. 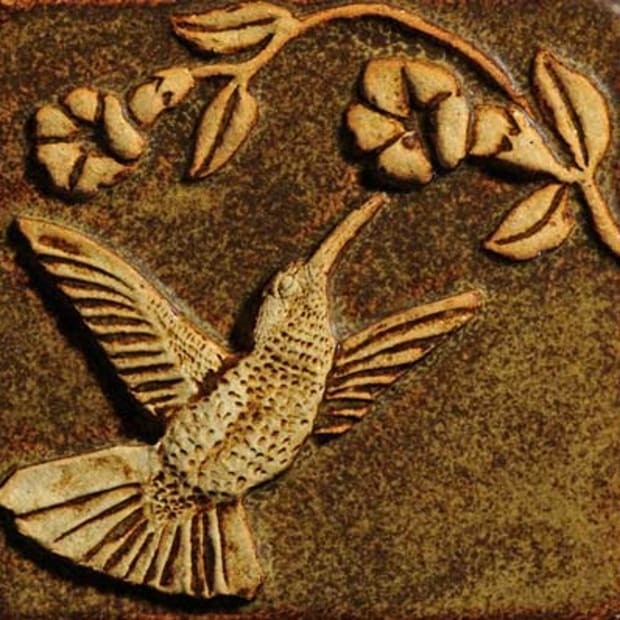 Decorated with cast birds and animals—squirrels, owls, sparrows—they set the scene. 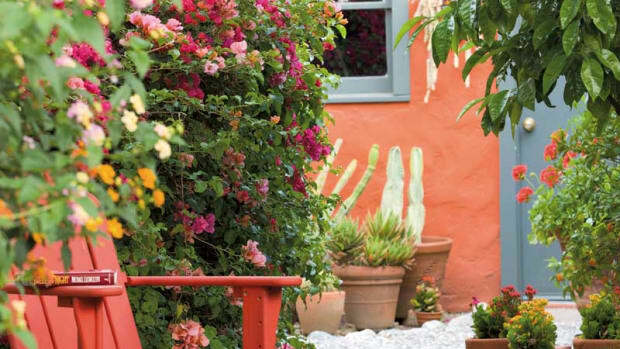 Container plantings and pots by Jeanmarie White–Brizio, colorful and lush, were placed throughout the garden as focal points and bright accents. 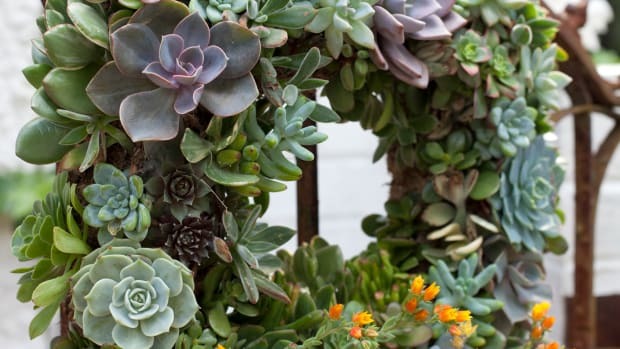 It has been her masterful eye overseeing the garden for the past decade that has given it continued beauty and appeal. 1 UNITY Integrate the house and its gardens together as a cohesive whole with a free flow between them. 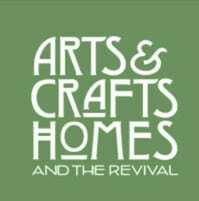 2 FUNCTION Outdoor recreational and service areas should relate to their interior counterpoints to make living comfortable. 3 SIMPLICITY Aesthetic and economic success depends on simplicity of design. 4 SCALE Elements should relate to each other in size and proportion to create a functional and integrated landscape design. 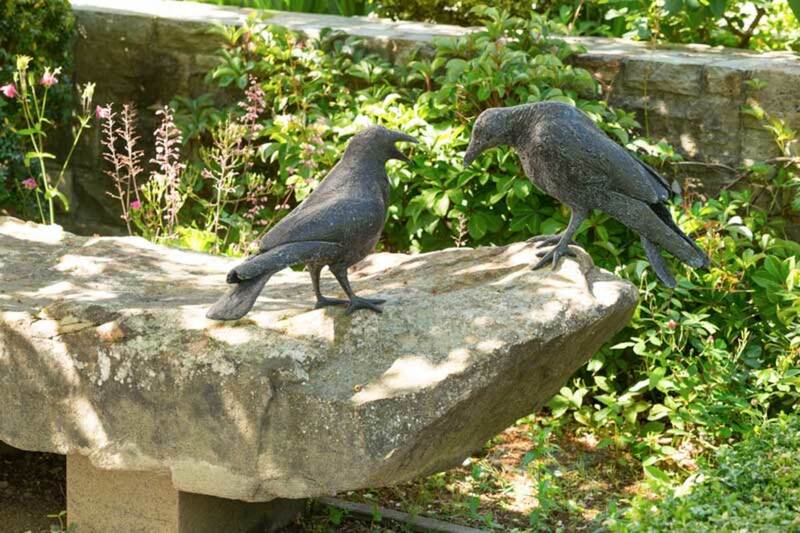 A pair of bronze birds adds an amusing accent. Roses cascade over stone balustrades in the rose garden.